Moonstruck Vol. 1 Review – AiPT! I’ll be upfront here — Moonstruck is not the kind of comic I’m usually down for. I like a little more angst, and a lot more cursing than Moonstruck‘s initial premise promised to provide. Julie is a werewolf who works at a coffee shop along with her best friend Chet the centaur. The world is filled with fantasy beings, from Julie’s roommates Mark and Lindi (a vampire and medusa creature respectively), to the clairvoyant psychic Cass and the regular customer Manuel the minotaur. Julie has just recently gone on a date with the perfect girl, who is also a werewolf, Selene. After a magic show date gone wrong that ends with Chet losing his centaurian legs, they must figure out how to get Chet’s legs back and maybe work through a rough patch in their relationship. 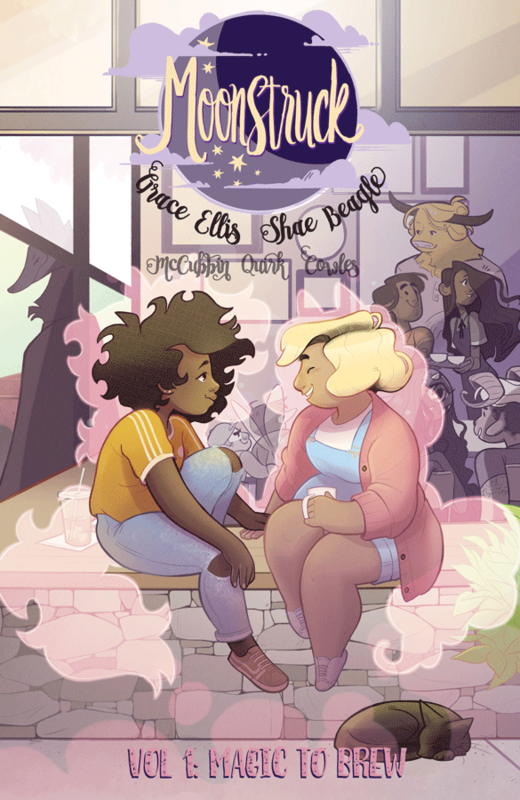 It’s an all ages comic written by Grace Ellis, one of the co-creators of fellow all ages comic Lumberjanes, with appropriately cute art by newcomer Shae Baegle. Moonstruck is a fluffy coffee shop au fanfiction come to life. The characters aren’t the most well rounded or versatile, but they serve the story well, and the writer keeps them from being completely one-note most of the time. My favorite character was the psychic, Cass. She has a super cute design, and the darkness related to her visions was just the right tone for the series. On the other hand, I found Chet completely annoying, and they did little to improve on their annoyingness throughout the comic. Most of the characters have their “thing” which is how it usually is in stories like this, but Chet’s thing was mostly just being a nuisance, and as a character, they really brought down my enjoyment of the comic. The conflict between Selene and Julie was totally fabricated for the sake of conflict. I get the urge to not have the ‘perfect gay couple’ trope, but I would have preferred that over them just fighting for no reason. It made Julie come off as whiny, which was unfortunate because a character can be sensitive without being whiny, but that wasn’t the case here. That, combined with the ending where it wasn’t clear to me if Julie knew the magician and even had the desire to be a human/eradicate magic, was puzzling. This would have been fine had it been clearly expressed at all beforehand that Julie wanted to be human. However, I just attributed the fact that she didn’t like people mentioning that she’s a werewolf to her being sensitive, but in the end whole thing just made the narrative seem muddy. I don’t want to be unnecessarily hard on this comic. I get that it’s an all ages comic, that it’s meant for young teens and preteens to enjoy, but that doesn’t mean that the clarity of good, multifaceted storytelling can be sacrificed. Kids are just as discerning about good plotting and relationship drama as anyone else. That being said, I do think that if I had been 12 and found this comic on the shelf, with all its gay and gender nonconforming inclusivity, I would have loved it. It’s definitely an important thing to include in children’s (and especially young teen) fiction, and it is done well here. It’s a part of the narrative, but the story doesn’t dwell on it, which is nice since there are plenty of LGBT children’s stories where gay or trans strife is all the story has going for it. Baegle’s art fits the story unbelievably well, and the color palette of light pinks, starry yellows, and rich purples is wonderful. It’s bubbly, youthful, and just varied enough to not seem like it’s repeating itself. The pages towards the end where the Babysitter’s Club-esque story within a story is blended with the main events of the comic, was especially striking. The character designs are great as well, especially the variety of skin colors and body types. Moonstruck is not necessarily varied enough for me to say I loved it, but for what it is and what it’s trying to accomplish, it did a commendable job. The art fits well, and apart from some hiccups in the storytelling, it told an all together enjoyable story. While I do see that Image is trying to branch out in the all ages department, if they’re not going to follow Moonstruck up with anything else, then I would say this would probably feel more at home as a BOOM! Box comic. Moonstruck is a great all ages comic, but fails to rise past its youth audience and appeal to older demographics. Art is really cute and enhances the story. The gay and gender nonconforming themes are great for younger audiences. Some of the plotting and storytelling is just plain bonkers. Chet is the most annoying centaur based character I've ever read. Might be better as a BOOM! Box comic if Image doesn't plan on following it with any other all ages series.